This circular was composed of two parts. 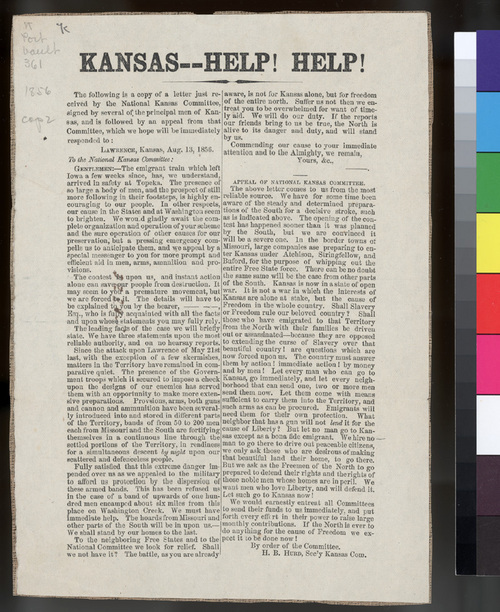 The first section was a letter written from Lawrence, Kansas Territory, to the National Kansas Committee, that asked for help because of the conflict in Kansas, stating that "instant action alone can save our people from destruction." The letter briefly mentioned the recent attack on Lawrence, and the proslavery forces which were gathering and organizing. Although there was a lull in the fighting, the citizens of Lawrence were looking for assistance and relief. The second part was a response written by H. B. Hurd, secretary of the National Kansas Committee, encouraging emigration to Kansas but raising the possibility that free state settlers in the territory must at times defend their rights. He wrote that "Kansas is now in a state of open war." People - Notable Kansans - Hurd, H. B.